Wednesday has arrived which means my weekly woof. It has been a quiet fun week in many ways with lots of Mom time. First of all because of the smoke and weather I had a bad allergy attack and poor Mom was so worried. I would go to the park and come home looking red like a tomato so she was wiping me down, doing everything she could think of but the itchy would not go away. What was worrying her was I was hopping with my left back leg in the air and she got concerned that I might hurt my back next. She had not changed my food, nor my treats but a lot of my dog friends are going through the same so we knew it was something from the park. In the end she went to the vet to get some Apoquel ewww which I am taking and it is easing slowly phew. Am now sleeping through the night again and letting Mom sleep too. 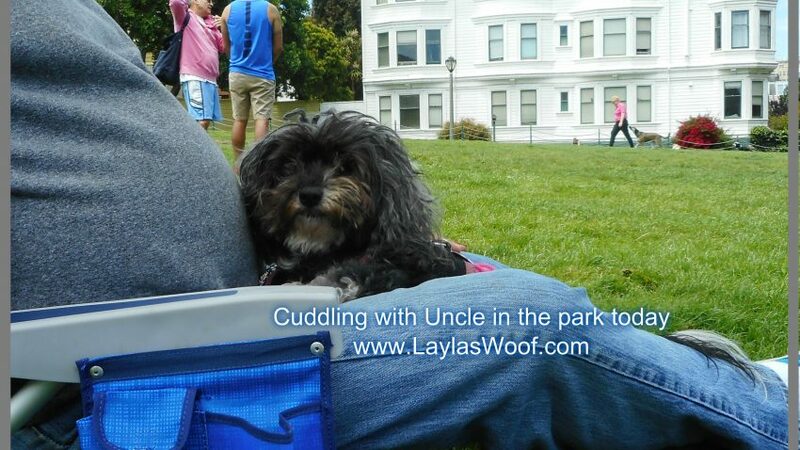 The weekend was busy as always as Mom says that is the time to be outdoors as the weather is fantastic for San Francisco so on Saturday we met one of my favorite Uncles in the park and just hung out, chatting, being petted and spoiled while Mom drunk her tea. It was a great couple of hours with Travis my Uncles Dog taking over the blanket so I went to visit our park neighbors and lay on theirs. They were very happy I did it and got lots of love from them. On Sunday was a special event in our dog park – It was the the 8th Annual Three Legged Dog Picnic! WOW we got there to see so many dogs, both three legged, on wheels and regulars also. There was music going, lots of people and they gave Layla a new toy, she was spoiled. Tri Pawed Dogs who organizes it does events once or twice a year. Everyone brings their own food and we all hang out together with our pets and families. A really fun time. There were different rescues there which was fantastic and always makes the events extra special. 01. Nobody’s Perfekt Dogs : They rescue imperfect dogs from local shelters and find them homes with loving families who tolerate the imperfections. What an amazing Rescue Organization and one I did not know about till Sunday. 02. Muttville Senior Dog Rescue : Muttville is an organization focused on how the world thinks and treats older dogs, aged seven years and older, and creating better lives for them through rescue, foster, adoption, and hospice. 03. Family Dog Rescue : Their mission is to save family friendly dogs from High Kill Shelters in California and after screening and vetting, they are then adopted by suitable families. Oh and we must not forget that we met Michael from DogParks.Tv and he took a photo of me which is on his Instagram so I am now famous woof. It was a really fun Sunday, when we got home I just went to sleep zzzzzz. I want to remind everyone that this coming Sunday Layla and I are doing the 6 mile AIDS Walk, as I am saying the two old ladies are doing it LOL and we will have lots of photographs to share next week. I must remind everyone that the heat is here big time and we all need to keep cool, once again thanks to CoolAid for my awesome cooling vest which is making my life so much more pleasurable when I am out. 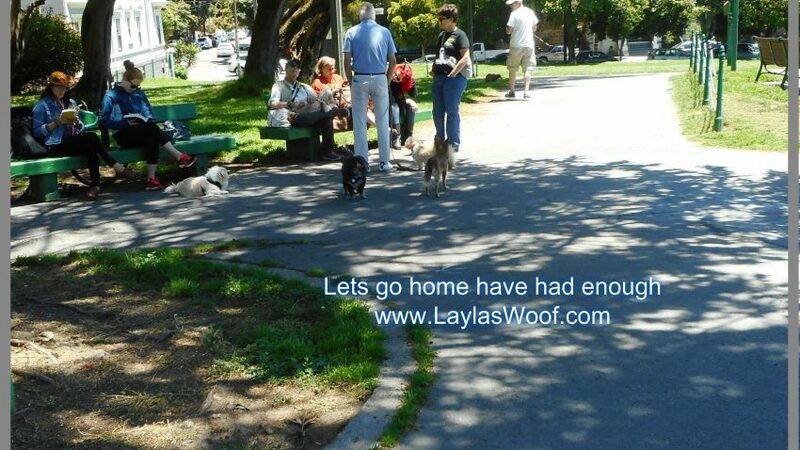 This entry was posted in Rescued Dog and tagged #dogblog, #dogparks, #dogs, #rescueddogs, Uncategorized by admin. Bookmark the permalink. How nice that you get to have all these activities and so sorry that you had to go to the vet. Sometimes it is better have a check up to prevent any issues. I am glad you feel much better Layla. Thank you for introducing us to so many rescue organizations. Sounds like it was a fun afternoon and put on by another fabulous group. I’m so glad you’re feeling better, Layla. Just in time for your walk! I hope that is an equally beautiful day. oh wow, you had a couple of great Summer days, Layla! I love that you go hopping from your blanket to the other dogs’ blankets – it’s like doggie Beach Blanket Bingo, LOL!! Oh no sorry about you going all tomato like. I wonder if it’s the pesticides, because Jack sometimes scratches like crazy after he’s been in the park. Good luck to you and your mom on the Aids walk, I swear you have the most interesting life ever. Love the 3 legged dog event, that must have been wonderful to see. I hope when Jack gets to Toronto with me this summer he’ll have half the fun you do. Such a busy pup! I am sorry you were itchy. Our service pup seems to get hives when she goes on our grass – which is a huge bummer. I hope she grows out of it or it may impact her chances at being successful in the future. What wonderful events! We have quite a dog friendly community in my area. I sure wish we could come up with some fresh ideas for the felines! I agree Anita – I would love to see more stuff happening for cats. There are a lot more public friendly cats than people realize. You have such an active social life, it sounds like a lot of fun! I’ll have to find Layla’s photo on Instagram. I’m glad she isn’t feeling so allergic! So Sorry allergies were bugging you. That can be quite unpleasant and sometimes even dangerous. I’m glad the meds are helping. Sounds like a fun summertime! The smoke is never a good thing, and many of us struggle when the air is smokey. But I’m glad the apoquel is working….expensive but it does work! I live in a part of Oregon that is allergy central for both humans and pets, so I know a lot of dogs on apoquel. What can you do when you are allergic to the entire valley? Have a great weekend! Can’t wait to see what you are up to next! All the events sound super awesome, we glad your allergies weren’t too bad and you were able to enjoy them. Wow! that was a busy weekend you had there, lots of fun and some good causes too. Good luck for your walk. Sounds like you had a fun time!! What a great event. I love it when people adopt special needs dogs. My Gracie has epilepsy and Yoshi has Juvenile cataracts. I am hoping to save up and get Yoshi’s cataracts removed. They are very mild right now, but they could get worse and if they do he will need surgery. I’m glad you’re getting over your allergies and it didn’t stop you from having a good time at the Three-legged dog picnic! I never heard of such an event. Great that Tri-Paws put it on. I once had a three-legged dog. Hope you do well at the AIDS walk. You guys are so busy, it’s amazing. I’m sorry you are suffering with allergies. That is no fun. You have a lot of great events in your area. 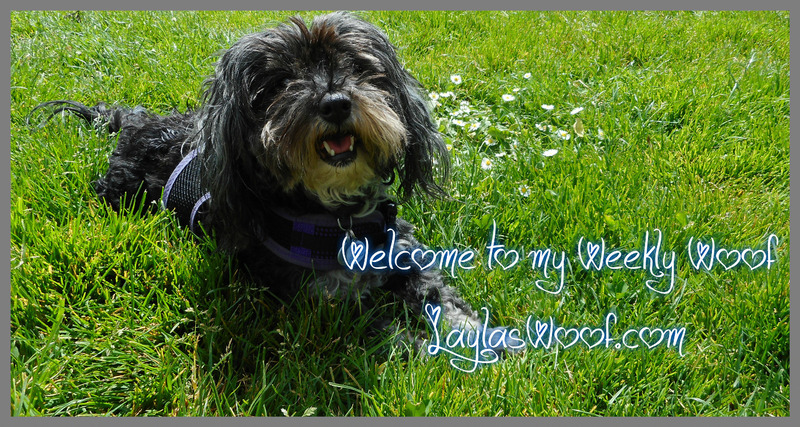 Glad you are feeling better, Layla. 🙂 Looks like an awesome dog event! I hope you are feeling better! Did you get enthusiastic again? Too much fun with mom eh? Hope you are on all four legs now and back to your normal color. What an uplifting event to attend…so glad that these tri-pawed dogs are finding happy homes. Sounds like you had a lovely weekend Layla. How did you do on the AIDS walk? I hope your leg was feeling better by then. What great organizations to cater to both senior dogs as well as dogs with “imperfections”. Stay cool. The heat is definitely wearing on all of us. Mr. N wears his cooling vest on walks too.